FRAMED PRINT. 22x18 inch (56x46cm) Framed Print with Black Satin with Off-White Digital Mat. 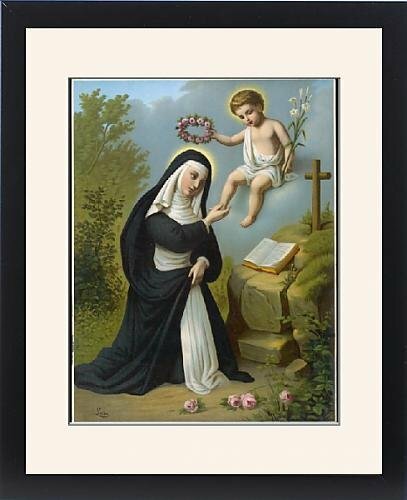 Artwork depicting ST ROSA DE LIMA. SANTA ROSA DI LIMA displays a luminous glow - a phenomenon reported of many religious figures, and which may have given rise to the idea of the halo or vice versa. Professionally made to order in the USA. Artwork Description... SANTA ROSA DI LIMA displays a luminous glow - a phenomenon reported of many religious figures, and which may have given rise to the idea of the halo or vice versa.